My husband and I fell in love at a music festival. We had just been introduced that week. He was in town visiting friends who did a lot of nudging to get me to meet him. Shortly after I did, I invited him to come to a music festival that weekend. I had previously bought tickets, sold them, then regretted it. I complained about this to him, and asked if he wanted to go. The next night he found a pair of tickets on Craigslist, drove two hours to pick them up, and rescheduled his flight to stay through the weekend. I’m a sucker for big gestures. We had just met, but we both figured, "Well, if we can spend three days in a tent together and not kill each other, we have a pretty good shot. If it doesn't work out, we’ll never have to see each other again." Lucky for us, it worked out. Less than a year later, we were engaged. Naturally, I didn’t want to go the traditional bachelorette party route. Don’t get me wrong, I love going out dancing at a good club. But it just felt off. My sister suggested we go to Hot August Music. I took zero convincing. It was perfect. 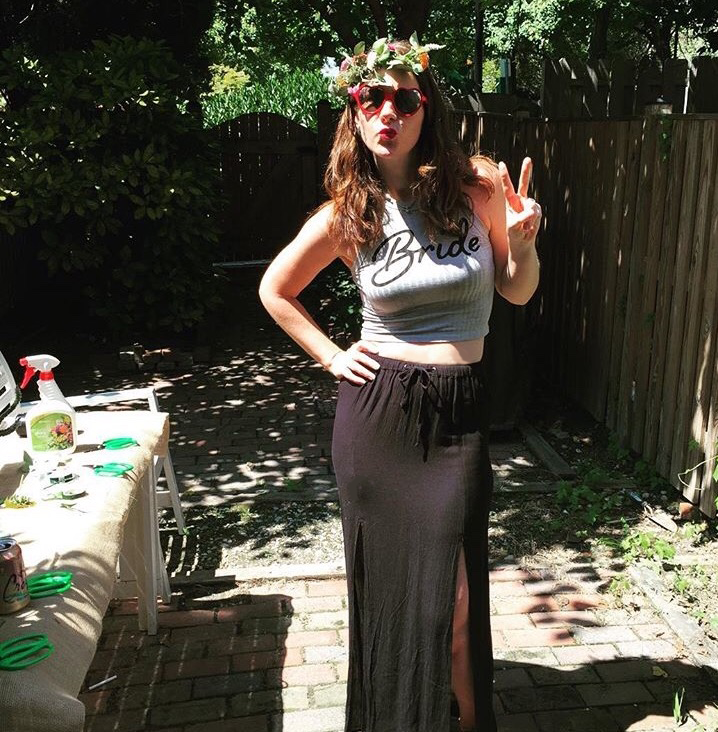 The morning of the festival, she set up a flower crown bar in the backyard of the Airbnb we rented. Slightly groggy from the welcome party the night before, we got to work on some mimosas and flower crown crafting. She had sunflowers, cosmos, mums, gomphrena, and eucalyptus. She showed us how to cut the flowers to the right length and work them into the wire crown using florists tape to secure them at the base. Each of my six girlfriends crafted a crown that perfectly suited their personalities. 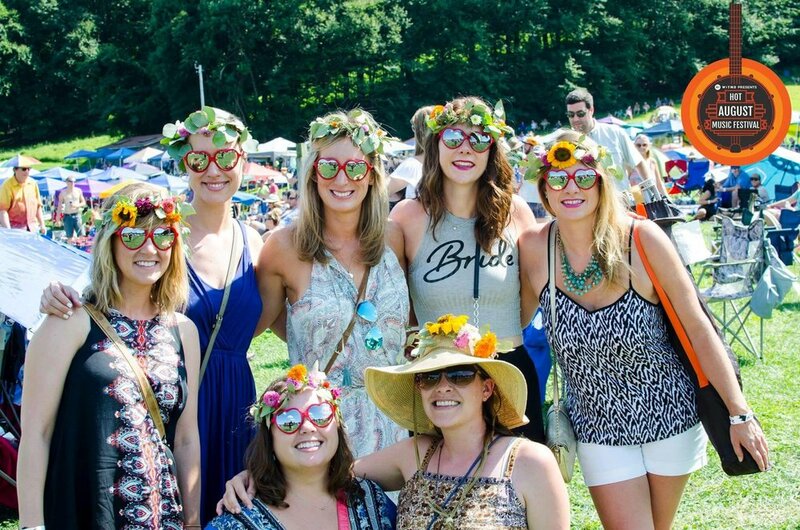 Katy used a large sunflower right up front like a headlamp, irreverent and slightly kooky. Veronica’s featured a lot of eucalyptus, making her look like a Greek goddess. Megan’s was balanced and even. Heart-shaped sunglasses and matching koozies completed the look. Was it a shameless, exaggerated take on festival culture? Yes. Do I regret it? No. Throughout the day, we got stopped constantly. People wanted to know where they could get one. Like woodland nymphs we staked out a spot near the back where we could sit in the shade, listen to the tunes, and laze on the grass all day. As night approached, we made our way down to the main stage to see Thievery Corporation. The reggae-pop mix was the perfect ending to a perfect celebration. The crowns survived the day and saw the revelry home to a dance party in the kitchen and a lot of memories made.